These purple damask and vellum wedding invitations are pretty simple to make at home and are beautifully elegent as well. I paired the damask with a contrasting floral belly band and moss green satin ribbon. I like the pairing of two completely different kinds of patterns. 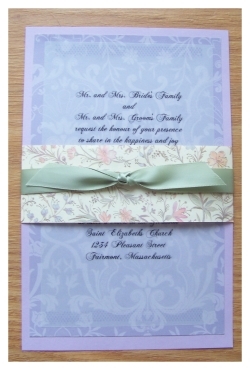 You could easily remake these vellum wedding invitations with a different color damask paper or different belly band. Switch it up to match your exact wedding colors or theme. 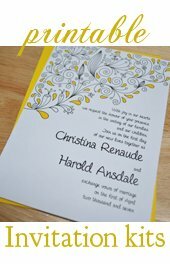 Start by printing the invitation wording onto some printable vellum. The vellum should be 8 1/2" by 11". You can order a printable text template that is set up to print two to a page. Try setting up the text 2 to a page yourself with a word processor or dtp program, or simply cut the vellum in half and print onto it singly. after printing the wording nto the vellum wedding invitations, it will be time to cut all of your papers to size. I like to use a personal slding blade paper cutter. Another great option, especially for those on a time crunch, is to bring the paper to a local copy shop. Just ask them to cut the paper for you on their hydraulic cutting machine. It's so much faster than doing it yourself (cutts an entire stack of paper all at once), is affordable (usually around $1.00 per cut, not per page), and gives a very professional look. First cut the cardstock in half giving you 2 separate pieces of paper measuring 8 1/2" by 5 1/2". Next cut both the vellum and the damask pattern paper in half (provided that they are both 8 1/2" by 11" pieces - if not you need to cut to size). Trim the edges of the damask paper to make the paper 8" by 5". Trim all four edges of the vellum to make pieces measuring 7 1/2" by 4 1/2". You'll also need to trim the 12 x 12 pattern paper to 2" by strips to create the belly bands to wrap around these vellum wedding invitations. The last step is to simply assemble them with a permanent glue runner. These adhesive runners are awesome! They make the job of assembly so much faster, hold tight forever, and make no mess! To assemble simply drag the tip of the glue runner across the back of the paper, starting with the damask paper, leaving a strip of glue at the top and bottom of the paper, and maybe a little on either sides. Adhere the paper to the cardstock by simply placing it on and smoothing it down. Be careful to center it as best as you can. Repeat this step for the vellum, but be as skimpy as possible with the glue on the vellum. It is hard to do it just right so that you cannot see the glue. I try to put very little and in small dots just at the top and bottom. To finish the damask and vellum wedding invitations just wrap the 12 x 2" belly band papers around the back of the invitation and secure it with the glue runner. Tie a nie big knot or bow across the front, around the belly band, and trim the edges of the ribbon with a pair of sharp scissors. Make sure and trim at an angle to get a nice clean look. Have You made some handmade vellum wedding invitations lately? Show them off by submitting them to our ever growing gallery of visitor's diy wedding invitation ideas!